When I bought my Torker back in 1981, we had a bike shop in my town called BIKE ALLEY. Ive been searching for a few old school things lately on the net but have had no luck and then decided to call the place where I bought my bike. I havent been there in years but was amazed it was still there and ran by the same guy that sold me my bike when I was 11 years old. He didnt have what I was looking for but he might have what your looking for or know someone who does? These old school shops could be of big help to some of us.If you know of any in your town that are still in operation,please post the name,number or website for some of us. Bottom line is that im kinda burnt on Ebay sales. I hope this info is helpful to someone. The dude who owns it, his name is Jeff and he's cool as hell. THis shop was owned by my brother-in-law's family BITD. He sponsored a team that raced locally mostly at Craimeur. It closed down 10 or more years ago or so. All the stuff is pretty much gone but there is talk that there is a complete Sting stashed away at their family's house. 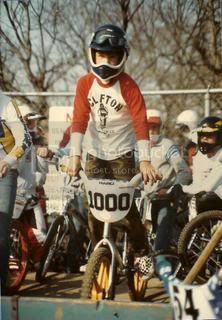 partially sponsored a bunch of riders (like me) in the area or at least gave them t-shirts and uniforms to wear when they raced at the tracks like Braddock. Got a lot of my bike parts there. Shop is still there but I heard he latest owner got in some trouble with Johnny Law. Great guys! Super knowledgable. They took the lead on restoring my Boss and are currently working on my 85' Redline, both of which I originally purchased from them. Zach Pilgrim is the mechanic who's been helping me out. A BMX guy himself. Definitely give him a call if you need some help with your biuld. He loves this stuff. And they ship all over the world. The original owner's of Shreve Island Bicycle Center sell items on eBay. I will have to see if I can find their seller ID. I saw a flyer for a freestyle show (81 or 82) signed by Mike Buff for sale a few weeks ago on eBay. The show was in Shreveport, LA at Shreve Island Bicycle Center. Fast BMX San Jose. Guys are great. Already bought all the OS tho. I still have my old uniform. A 1 bike store west minster cal ben open since 1969 only carys BMX and skate board. (714)893-3706 A-1 CYCLE 13752 goldenwest st Westminster ca. still open and owend by the same family! it's no longer there, but the wilkes barre/kingston location is still open. both in Cranston, Rhode Island....and both long gone. those were the days...if I could only get my hands on all their inventory right now! I Need A Patterson Padset!!! Please Someone Help Me Out!!! Hutch/CW back in the day! OHHH too many bikes...so little time. Long gone,but I recently knocked on his door and purchased his remaining old school stock.He ran it out of his garage,all bmx,freestyle,and skate.Small but he usually had what you needed and if he didn't he would find it for you.Super cool guy. Good times,great memories,Damn I miss that place!! hank n frank, ever heard of them? maqilordered from them, as i lived on a mountain top in the middle of bfnc, and had no access except. that was bitd...late 80's. Was this right in wakefield MA? my uncle and cousin are clueless.